This text fulfils its aim to ‘take the reader back to the roots of grounded theory’ without compromising its three tenets: exploration, emergence and constant comparative analysis. The book begins with an account of learning outcomes and ends with a summary, questions to test knowledge and further reading. It also includes five expansive appendices, one of which includes worked examples. 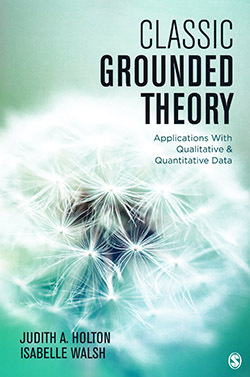 The first chapter argues that, because grounded theory is a general research paradigm, it does not reflect any single philosophical perspective. The second explores the different meanings of theory and theory building, and includes diagrams to explain the differences between substantive and formal theory. Data collection and the iterative nature of the constant comparative methodology are covered in chapter five, while chapter six, focuses on the analysis of data. Here, the authors include useful figures and tables to emphasise the importance of analytic memoing and advise on how to write productive memos. The seventh chapter takes the reader through the concepts of theoretical sampling and the final three chapters focus on writing for publication and evaluation. Overall, this is a useful text, particularly for postgraduate students who want to use grounded theory for their dissertation or thesis.